The SIG P229 is an advanced version of the Sig Sauer P226 and was designed intentionally to act as a concealed firearm. 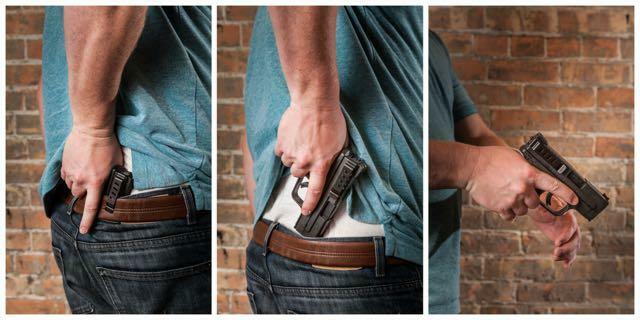 A holster not only provides you with a comfortable pouch to carry your handgun, it also protects your firearm from damage, accidental firing and even theft. Choosing the right holster for your SIG P229 is necessary, and there are certain factors you must take into consideration before buying. Here we’ll be talking about why you should buy a decent holster for your SIG P229. We will also review the best SIG P229 holsters on the market to help you with your buying decision. The SIG P229 is intended to be a concealed carry firearm, besides it is an inevitable norm to carry your handgun in a holster. A holster serves several purposes for your firearm. It helps you in concealing the firearm while you carry it, protects your weapon from dust and dirt, provides quick access, prevents accidental discharge and prevents theft or loss. The first and foremost concern is safety. If your holster is stiff or has any loose ends, your trigger might get caught. Resulting in an accidental discharge while you holster your weapon. A good holster provides good concealability which gives you an upper hand in self-defense situations. Meanwhile, it also doesn’t offend anyone near you while you move around a public place. A holster made up of good material, and with a proper fit protects your skin from rashes or bruises and ensures you stay comfortable while you carry your weapon. 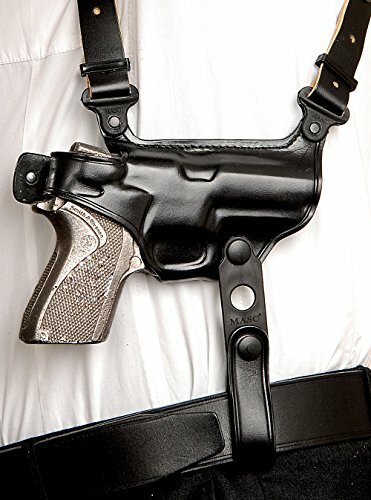 If you have problems like chronic pain, back pain, finger arthritis or any other medical condition, or you are a mom carrying your kid in your arms, you should invest in buying a proper holster that fits your needs perfectly. Your SIG P229 holster should provide proper concealment to your weapon. There are different types of holsters available in the market. Some popular types include: IWB (Inside Waistband), OWB (Outside Waistband), Belly Band, Ankle, Shoulder, and others. Choose a holster which provides proper concealment to your SIG P229. It will give you an upper hand in self-defense situations and will also not offend people near you. Holsters are generally available in three different types of materials. Leather, Nylon, and Kydex. While leather may be the better option, Kydex and Nylon are comparatively less expensive. Your holster must fit comfortably with your body and different postures. Make sure to assess any physical ailments, or other preferential factors before choosing one. A good holder must be easy and quick to slide in and out your SIG P229. Additionally, it should hold your weapon snug without wobbling. Some holsters have screws to help fit the handgun size whereas others have stretchable designs and locks. Additionally, the holster should be easy to reach, and it should be quick to draw your weapon. Based upon the above-mentioned aspects and features, we have sorted out some of the best SIG P229 holsters on the market. These holsters feature different designs and materials, but all of them are the best in their class. Perhaps this list does contain the holster of your choice, thus helping you with your purchase. The Blackhawk Serpa Sportster Holster is probably the best holster for your SIG P229. The holster features an OWB (outside waistband) design and can also act concealed if you tuck-out your t-shirt or shirt, or wear a suit. 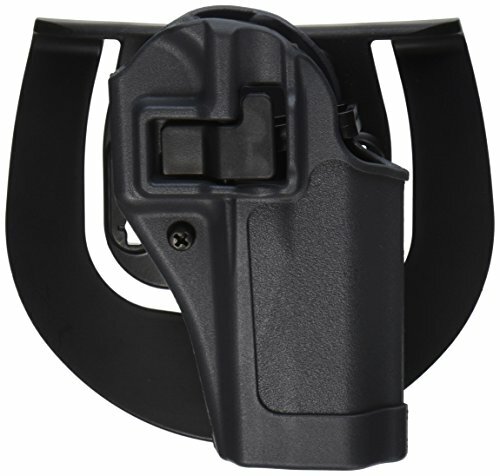 This holster has been made using injection molded polymer which keeps it lightweight. The SERPA lock technology facilitates quick and safe draw and retention of your weapon. Fits Shoulder, S.T.R.I.K.E., Quick Disconnect and Tactical Holster Platforms. The L-shaped button is optimized for security and performance, so the weapon draws easily. People with long fingers. will have to resist the temptation to press the L-button with their fingertip as they will end up with their finger pressing onto the trigger. The holster is of good quality and has been priced decently. Paddle Can Be Replaced With A Belt Slide. People With Long Fingers Might Face Problems. Might Produce A Very Low Rattling Sound. The Blackhawk Sportster Holster is a lightweight, secure and easy to use a holster for your SIG P229. It is compatible with different mounting platforms and is quite inexpensive. The polymer body is lightweight and won’t be a burden on your waist. Perfect for civilian use and daily carry. The IWB holster has been made using 100% native American Steerhide leather which is reinforced and double stitched to provide exceptional quality and comfort. The holster can be used with a leather belt making it easy to conceal and carry. The hand-molded exterior of the holster provides secure retention for your SIG P229 at all times. Apart from all this, the holster is covered by a lifetime warranty so you can rest assured about the quality of this product. Easy to Conceal And Carry. No Retention Mechanism For Tightening. The SIG P229 IWB holster features a 100% leather design which makes it very comfortable and soft on your weapon. The holster features a simple design, but lacks advanced features like retention adjustment or draw-lock, which is a setback. Good for people who love simple old-fashioned holsters. The Comp-Tac international holster is a kydex material holster, intended to be used for tactical purposes. The holster has an OWB (Outside Waistband) design and a modular mounting system with interchangeable mounts and adjustable cants. 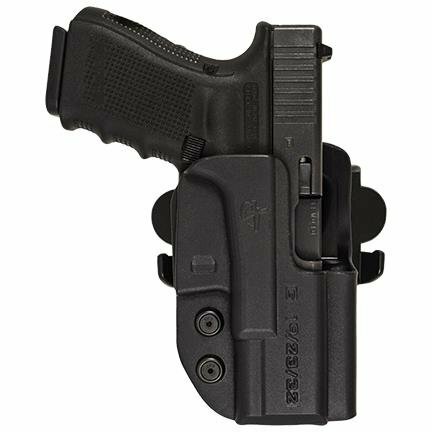 This kydex holster is lightweight and perfect for tactical and range use. It is available with three different cant options, the speed draw (straight drop), the FBI cant (grip angle forward), and the reverse/cross draw (grip angle rearward). This model also has other variants which suit other models of the P229 like .40 Rail, .40 Elite, 9mm Elite, and 9mm Rail. Not Configured For Ambidextrous Use. The Kydex Tac Holster is good for tactical applications and features several advanced mechanisms to facilitate quick draw and safe retention. Different variants of this holster are also available for different P229 models. The holster is perfectly fit for P229, except for some minor adjustments you have to make when switching the side (right to left or vice versa). This Leather shoulder holster from MASC has been made using premium leather, which provides an elegant look along with comfort and durability. The leather holster has been stitched from the inside which also protects your handgun. This holster is compatible with all models of the SIG P--- range. The shoulder holster setup has an adjustable harness length which makes it suitable for long, as well as short people. The other end of the holster has a double magazine holder. 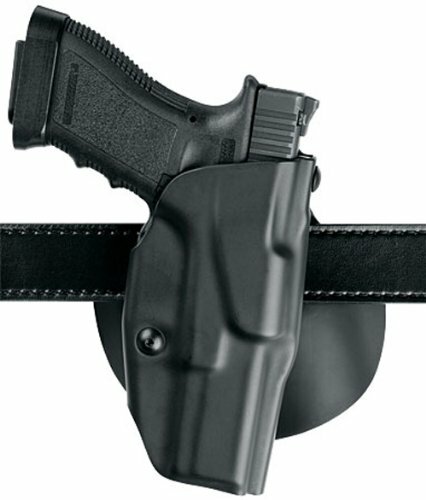 Both the holster and the magazine holder ends can be attached to the waist belt for comfortable carrying. The holster sits horizontal, and this shoulder holster provides high concealment for your weapon. Carrying Space For Two Magazines. Can Be Attached To The Belt. Cannot hold P229 With Sights Or Rails. Might Increase Sweating In Hot Weather. Might Wobble As You Move. This Shoulder Holster allows you to carry a couple of extra magazines which is obviously a plus point. The holster can be easily worn over the shoulder and provides concealment if you are wearing a suit or jacket. Otherwise, it doesn’t. The harness is adjustable making it suitable for people of all heights. The premium leather offers an elegant look, so it is good if you wanna show off. Good for people who want to carry some extra ammo without effort. This holster features a thermal molded polymer construction with an inner suede lining to protect your weapon from scratches and damage. The holster features an ergonomic soft nylon paddle and an optional fully adjustable belt slide. The holster features an ALS (Automatic Locking System) which requires you to use the thumb while drawing the handgun. The holster sits low on the waistline and tight towards the body. Well Made Holster With Stitched Inner. Ergonomic Paddle And Adjustable Belt Slide. Different Models For P229 Manufactured Before And After 2008. The Safariland holster is a nice and compact holster with an automatic locking system. Making it perfect for everyday carry and range use. The holster fits the P229 perfectly and can be easily attached to your belt. The Galco Halo Belt Holster is a leather holster with a thumb strap to secure your gun in place. The holster is very well made and is intended to accommodate P229 with tactical lights attached. The holster is perfect if you use your handgun mostly at night. Vertical orientation allows a smooth draw without cocking the wrist. 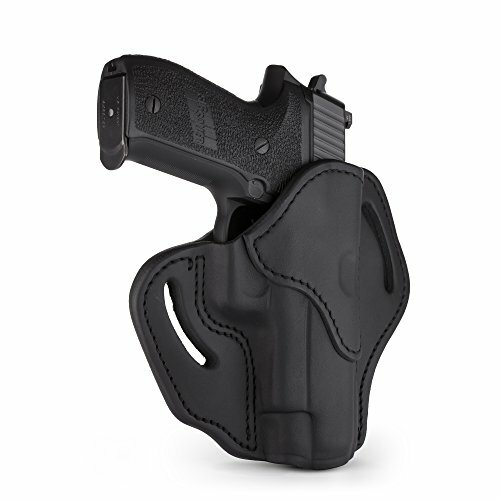 This holster is very compact to conceal and fits belts up to 1 ¾” wide. Can Accommodate A P229 With Light. Leather Body Makes It Comfortable. Perfect For the SIG P229. Cannot Be Modified Into A Paddle. Single Belt Loop Makes It A Bit Unstable. The Galco holster is a compact leather made holster which is quite comfortable and high on concealment. The holster can fit a P229 with tactical lights already attached. So it is good for people who like to use their weapon more at night. 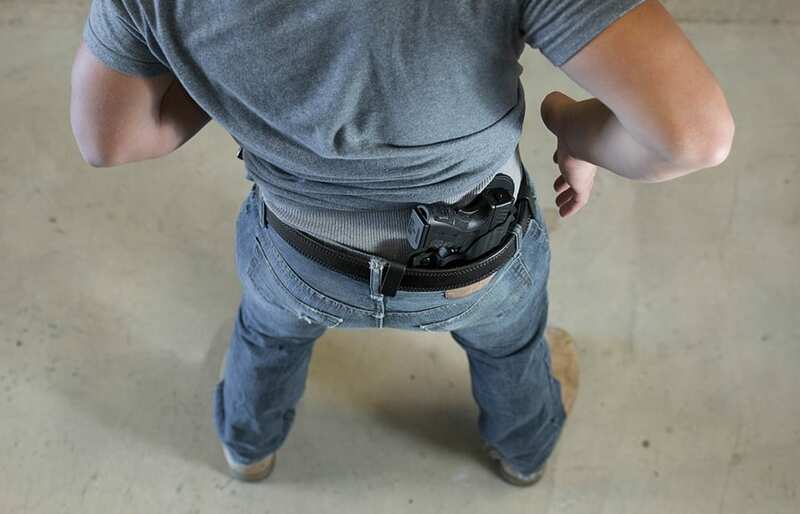 A good holster ensures not only the bearers safety but also the safety of the people around. A good holster must be easy to conceal, have a good grip, should offer protection to the weapon, and must be comfortable. Retention locks and other advanced mechanisms help with the functionality of the holster. There are holsters with different types of designs available on the market, so it ends up to be a matter of personal discretion which type to buy.